Even if you can’t sing well, sing. Sing to yourself. Sing in the privacy of your home. But sing. Common sense is strengthened by joy. 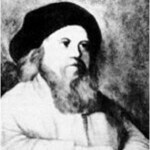 Rebbe Nachman, a great-grandson of the Baal Shem Tov, breathed new life into the Hasidic movement by combining the esoteric secrets of Judaism with in-depth Torah scholarship. He attracted thousands of followers during his lifetime and his influence continues until today through many Hasidic movements such as Breslov Hasidism. Rebbe Nachman's religious philosophy revolved around closeness to God and speaking to God in normal conversation "as you would with a best friend." The concept of hitbodedut is central to his thinking.